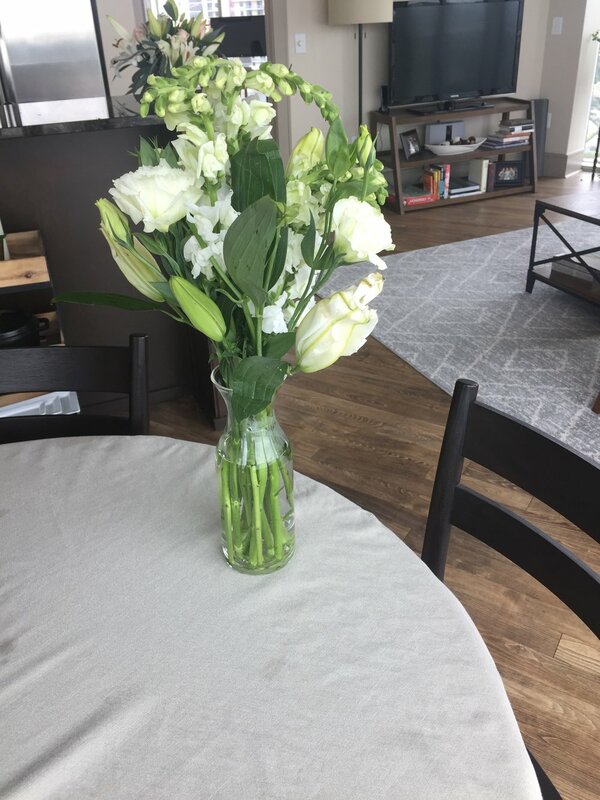 When this happens, first I launch into a hundred different accusations about what I did wrong -- certainly I did something to make the flowers stop smelling so wonderful. Then I make a plan for how I'm going to get the flowers back: I will get a new job; I will try a new diet; I will run five extra miles; I will never eat bread again. After this, I go into survival mode. I hunker down because no one must know that I cannot smell the flowers today. I must have done something wrong, if I cannot feel joy and laughter and abundance. There must be something terribly, awfully shameful about me. And I must fix it right away as fast as possible. The scariest feeling I know is when all the most wonderful things in my life go blank. The flowers are a metaphor, in case you couldn't tell. The flowers are lots of things in my life, too many to name. This is a pattern in my life, for as long as I can remember. Getting married brought this cycle front and center. In the last three months, I've had mounting panic attacks and a series of sobbing sessions where I all I know to say to my husband (Lee) is, "The sadness keeps coming back." With his love and support (as well as my doctor and counselor and meditation practice), I'm learning how to work with the reality that is my life: some days are wonderful, others are just OK and some are very dark. 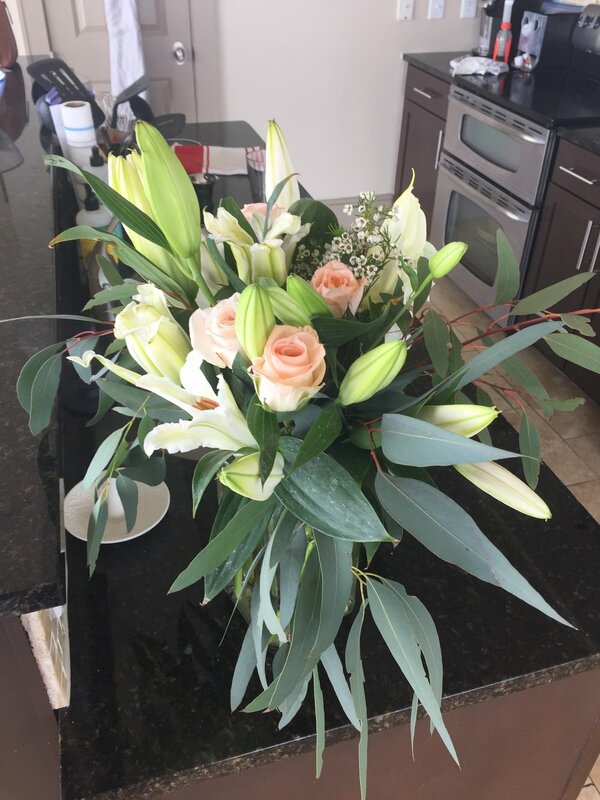 On Wednesday he sent me flowers from Farm Girl Flowers, and he went over the top -- ordering their "fancy pants" bouquet. I've never seen so many flowers in all my life. There were enough for me to play Flower Shop all afternoon. In fact, there weren't enough vases in my house to take care of them all. I grabbed water canisters, a diffuser with a turn knob, anything that could hold water. I made four full bouquets from that one delivery. And though I felt appreciative, when I looked at the flowers, I mostly felt blank. 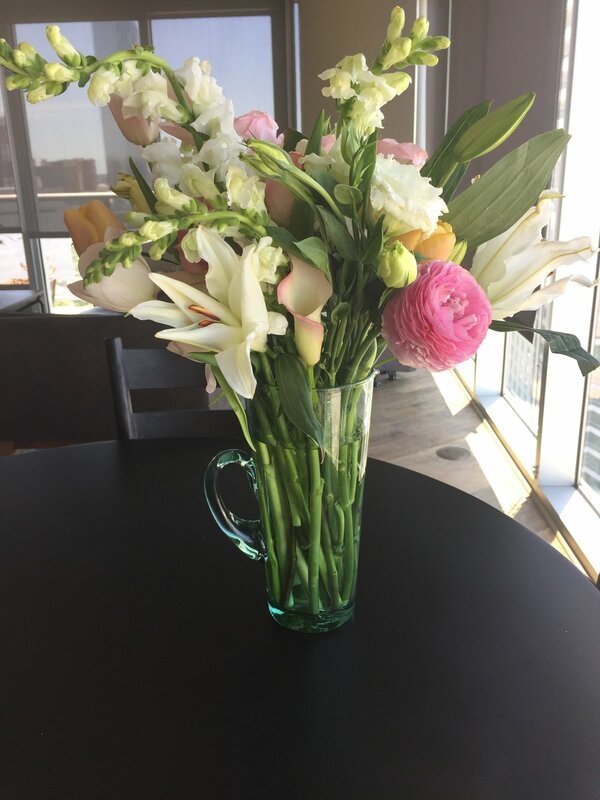 My mind could process the tremendous gesture, the practical steps he took to order the flowers, to be thinking of me. It was a powerful, tangible reminder that my husband loves me and is on my side. But I could not feel much of anything. I could not respond to them in the usual way (a sign that I'm somewhere in the darkness right now). Rather than focusing too much on this "disconnect" between me and the flowers, I turned to more practical matters. I realized I probably should call someone at Farm Girl Flowers about the state the box came in. You can see the corners were banged in on all sides, not to mention the ranunculus in the bouquet were all broken right beneath the bud. It was such a departure from the quality I'm used to receiving from these folks, and I knew a fellow entrepreneur would want to know about it. When I told the customer service rep about what had happened, she insisted they send out another delivery right away. The whole thing. Again. We're talking 70 stems plus greenery. I couldn't tell her no -- even though I knew I didn't have any more room or vases. Something inside me chose to say, "OK, that sounds just fine." Another box arrived a few hours ago (see below). Why would anyone who has no guarantee of a decent day want to go on living? Andre Gide says "It is the hope of reaching you that makes me think the steepest path the best." And this is what my answer must always be on my hard days. It is the hope of hearing my babies cry. Of growing old with Lee. Of writing books that people read. Of finding a balm (however temporary) to aching, lonely hearts. When the panic sets in and I am crying on the floor, I will remember that there is life beyond the darkness even though it may not feel like it at the time. It is the hope of laughing again, of smelling the flowers again, that is enough right now. So, many thanks to my Guardian Angel Florists at Farm Girl Flowers. You're doing magical work. Don't ever forget it.